Five years ago Ilya Kovalchuk signed a monster 17-year deal with the Devils that rocked the NHL and New Jersey for years: SI Vault feature from 2010. On the fifth anniversary of the NHL rejecting Ilya Kovalchuk’s eye-popping 17-year, $102 million contract with the New Jersey Devils in July 2010, we present this feature, which originally appeared in the Nov. 15, 2010 issue of Sports Illustrated magazine. Subscribe to the magazine here. Kovalchuk proudly wears the number 17 on his sweater, primarily as an homage to his father’s favorite player, Valeri Kharlamov, another left wing and an icon of Soviet hockey who died in a car accident in 1981 at age 33. In Russia, Kharlamov’s number has the same cultural gravitas that 99 carries in Canada. But its significance to Kovalchuk runs deeper than that. His first two children with his wife, Nicole, were born on Oct. 1 and Feb. 7, respectively. And his life changed forever four years ago with the death of his father, Valeri, the man who shaped him as a hockey player, on July 17. “It’s with me everywhere,” Kovalchuk says of his number. Lamoriello didn’t know how much the number meant to Kovalchuk. Neither did the NHL. Hours after Kovalchuk signed the contract on July 19, the league voided the agreement on grounds that it circumvented the salary cap by artificially lowering Kovalchuk’s yearly cap “throwaway years” at the end. (The deal would have paid Kovalchuk almost 97% of the $102 million in the first 11 years of the contract.) The dispute dragged on for three weeks. An arbitrator upheld the league’s decision on Aug. 9, and 19 days later Kovalchuk signed a 15-year, $100 million contract with New Jersey that increased his cap number from $6 million (under the voided deal) to $6.67 million. As a result of the ordeal the players’ association agreed to new, stricter regulations governing front-loaded long-term contracts. It was unheard of for the Devils—one of the NHL’s most conservative franchises under the hypercontrolling Lamoriello—to expend so much money and effort on one player. Then again, it had been out of character for the team to trade for Kovalchuk last February. The conventional wisdom around the league (and even inside New Jersey’s dressing room) held that Kovalchuk, who was due to be paid about $2.5 million for his two-month stint in the Garden State, was just a high-priced rental. He was, after all, a one-way forward on a tight-checking club committed to defense, a pure scorer with a grand total of four playoff games to his credit. But there was something that Lamoriello liked about Kovalchuk, something the G.M. would go to great lengths to keep. 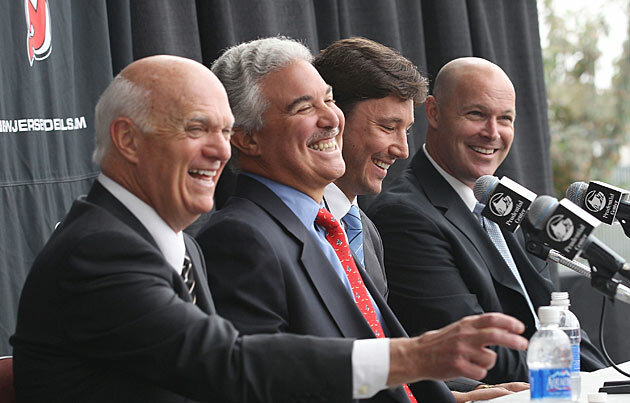 (Left to right) Devils GM Lou Lamoriello, owner Jeff Vanderbeek, Ilya Kovalchuk and coach John MacLean at the press conference announcing the big contract. In theory, the addition of a sniper who averages 42.3 goals per season will fortify an offense that rarely lights up opposing nets. For years the Devils have skated by with middling attacks, playing sound defense and trusting in their nonpareil goaltender, Martin Brodeur. On the eve of the 2010-11 season, the club had allowed only 1,716 goals over the last 10 years, by far the fewest in the league. But the 38-year-old Brodeur is nearing the end of his Hall of Fame career, and post-lockout rules changes have all but eliminated the neutral zone trap that New Jersey used to win three Stanley Cups between 1995 and 2003. The team is at a crossroads. The addition of Kovalchuk, a creative playmaker, was not just an attempt to address a nagging deficiency; it was also the Devils’ crack at joining the rest of the NHL in the 21st century—a bold move to bring to New Jersey the kind of young offensive talent that fans in Pittsburgh and Washington take for granted. The result is a club in disarray, with almost too many recent breakdowns to count. After the Devils took a 1–0 lead early in the second period against Boston on Oct. 16, the Bruins poured in four unanswered goals in less than 15 minutes. Eleven days later, in San Jose, the Sharks’ top line scored every goal in a 5–2 victory. “It was like they were playing against kids,” Brodeur told reporters after the game. Kovalchuk started slowly, in part because coach John MacLean installed him out of position, on the right wing alongside top-line center Travis Zajac and left wing Zach Parise. Kovalchuk scored just three goals in the first 14 games and checked in at -6. He was moved back to left wing on the second line with center Jason Arnott and winger Patrik Elias on Oct. 24 but returned to the first line a week later after Parise was lost for three months with a torn meniscus in his right knee. In Kovalchuk’s first game on the left, alongside Zajac, he had two assists in a 5–3 victory over the Blackhawks. The struggles have reinforced the notion that Kovalchuk is not a team player, that he is only concerned with looking out for No. 1—or, rather, 17. And his costly contract has made him an easy target for criticism in the media and resentment in the dressing room. When he was a healthy scratch—reportedly for having been late to a team meeting—at a home game against the Sabres on Oct. 23, the club’s detractors noted that the Devils had wasted $81,300 on the bench, throwing away money that the club could barely afford to spend in the first place. He’s become the gift that keeps on taking. The image is seared into the minds of many Canadians who were watching the 2001 world junior championships in Moscow: a young Russian whirring down upon the empty Team Canada net, thrusting his right fist high into the air twice before scoring to seal a 3–1 victory for his country. The match was relatively meaningless, an early round-robin meeting, but Kovalchuk has yet to live down that hotdogging gesture. 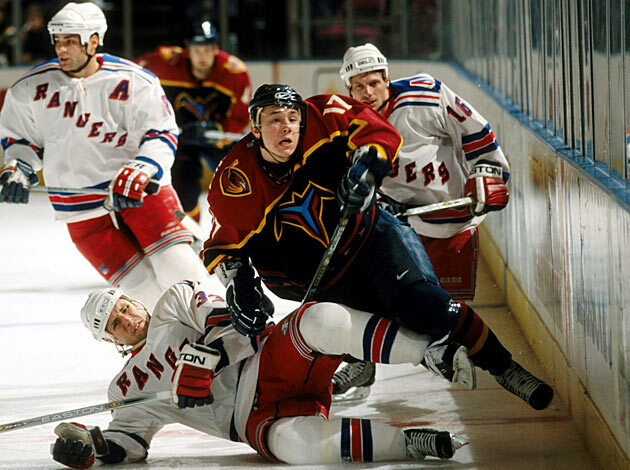 Ilya Kovalchuk with the Thrashers in Nov. 2001. When Valeri died in 2006, Ilya embraced the role of the head of his family—not just for his wife and newborn daughter but also for his mother and sister. “He’s a very, very caring individual,” says former Atlanta coach Bob Hartley. When the Thrashers’ tailor would come to fit players for custom suits, Kovalchuk would remind him not to forget the trainers—billed to number 17. He’d offer rookies or call-ups the keys to his extra car to use while they were in Atlanta, and he took great pleasure in bestowing gifts on his friends, from good meals to flight vouchers he earned as part of a sponsorship agreement. Why wouldn’t it? When the national team calls, Kovalchuk always answers—and on the first ring. He was the first Russian star to agree to play in the world championships last spring, even though he had just finished a grueling season that included the Vancouver Olympics. Kovalchuk has captained back-to-back world championship teams, scoring the gold-medal-winning goal in overtime in 2008 and being named tournament MVP in 2009. He burns to leave a similar legacy in the NHL. His next goal is to win a Stanley Cup. That’s why he signed with New Jersey, where the model trophies in the dressing room are a reminder that this team knows how to win it all and where Kovalchuk can shed the disappointments of the past—Atlanta played in only four postseason games during his 10 years there, and lost them all—and prove his worth. When he arrived last February, he made a point of telling the press that he was +1 for the season. In spending so much capital to keep Kovalchuk, Lamoriello has gone against everything he has stood for in his 23 years at the head of the Devils’ front office—which has led to speculation that owner Jeff Vanderbeek was behind the move. Beset by injuries and hard up against the salary cap, New Jersey dressed only 17 (there’s that number again) players for a 3–1 loss to the Penguins. Tremblay also has no doubt about Kovalchuk. “Mark my words, he’s going to help the team bring the Cup back to Jersey,” he says. So just how long will it take? The Devils aren’t anywhere close to being a playoff team. For the time being, at least, the rest of the hockey world is left to wonder.